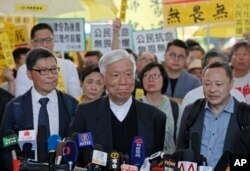 Occupy Central leaders from right; Shiu Ka Chun, Lee Wing Tat, Raphael Wong, Benny Tai, Chan Kin-man, Chu Yiu-ming, Tanya Chan, Eason Chung and Tommy Cheung arrive a court in Hong Kong, April 9, 2019. Mandarin Service correspondent Shen Hua from Hong Kong contributed to this report. HONG KONG — The original architects of Hong Kong’s 2014 democracy protest known as the Umbrella Movement were found guilty on Tuesday of public nuisance charges in a verdict that has already been criticized by political leaders and rights groups. Benny Tai, Chan Kinman and Reverend Chu Yiu-ming, three of Hong Kong’s most respected democracy leaders, face up to seven years in prison after they were found guilty of conspiracy to commit public nuisance. The three stood trial on Tuesday alongside six other leaders from the Umbrella Movement. They included sitting legislators Tanya Chan and Shiu Ka-chun. The group has been named the “Umbrella Nine” by local media. Sentencing was delayed until Wednesday but court employees said it could extend into Thursday because defendants submitted mitigating evidence to offset a possible lengthy prison term. 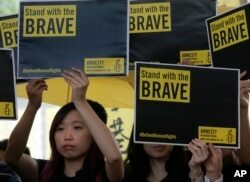 The defendants were charged under common law, rather than with statutory charges, which means they face a sentence of up to seven years in prison as opposed to several months, according to a report by rights monitoring group Amnesty International.